Princeton University is an ideal backdrop for a wedding. The architecture is elegant and austere and the entire campus is warm and inviting. From the soaring stone buildings to the quiet arches, the intimate corners with beautiful light to the lawns dappled with brilliant sunshine. Whether you studied at Princeton or not, the campus and surrounding areas are a popular location for wedding day portraits! At this Princeton wedding the bride was walking from her hotel to see her fiancé for their first look. I loved the look of her custom gown and her neutral Valentino heels. I wanted to capture the grace in the movement of her dress so I waited until the bride was walking down the stone steps and the wind picked up the hem of her dress. There are moments to be found at every wedding, both large moments and small ones. Sometimes it's a bride crying while she gets dressed. Sometimes it's a groom's face exploding with joy as he sees his husband walk down the aisle towards him. 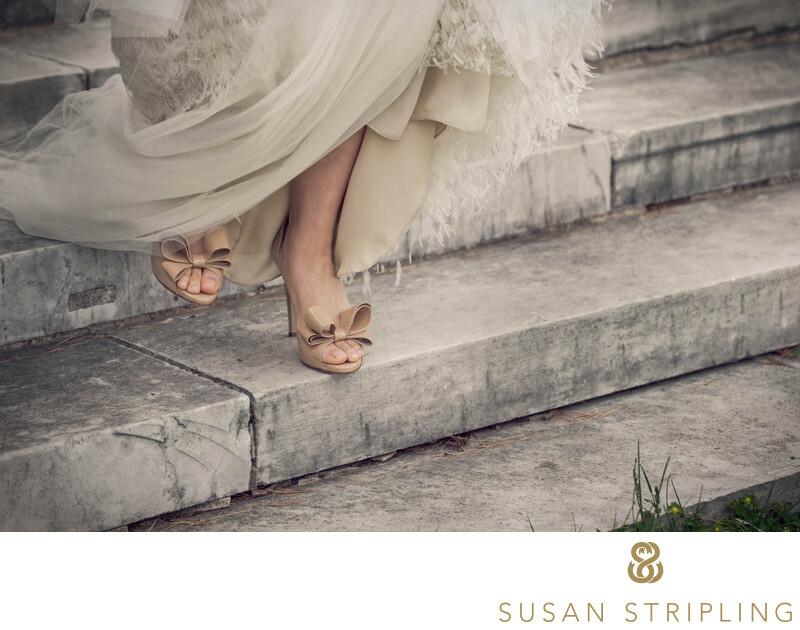 Sometimes it's the quiet movement at the hem of a dress moving down a set of stone steps. If I am your wedding photographer, I promise to find those moments for you, both big and small! Keywords: princeton (24). 1/500; f/4.5; ISO 200; 110.0 mm.